For years, hunters and conspiracy theorists have fantasized about the existence of the Yeti, a long-thought extinct ape-like beast roaming the wilds of Canada – and we’re not talking about Hugh Jackman in the middle of a Wolverine shoot here. No definitive proof of the Yeti – or Big Foot as he’s more affectionately known - has ever been submitted, but there’s certainly proof that Yeti-inspired games are alive and well and ripping up the online slots scene. 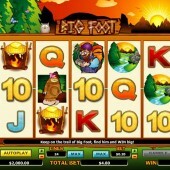 The latest is Big Foot, a 5 reel, 25 pay-line slot from leading developers, NextGen Gaming, which sees your eager hunter on the trail of the abominable snowman and his size 15s. On the reels, we’re all Alaskan Fishing, the adventure-themed slot from Microgaming, with the reels adorned with pine trees, flowing rivers and wide skies. In terms of symbols, we get the hunter, the hunter’s campfire with a juicy sweetcorn roasting over it, a mountain scene, a Bigfoot footprint (which features a nice animated foot that lands with a satisfying thud whenever it forms a winning combo), Bigfoot himself, and the standard 10-through-Ace symbols. The Wild is the Bigfoot himself, and he appears on reels 2, 3 and 4 only. He substitutes for all symbols other than the Footprint. 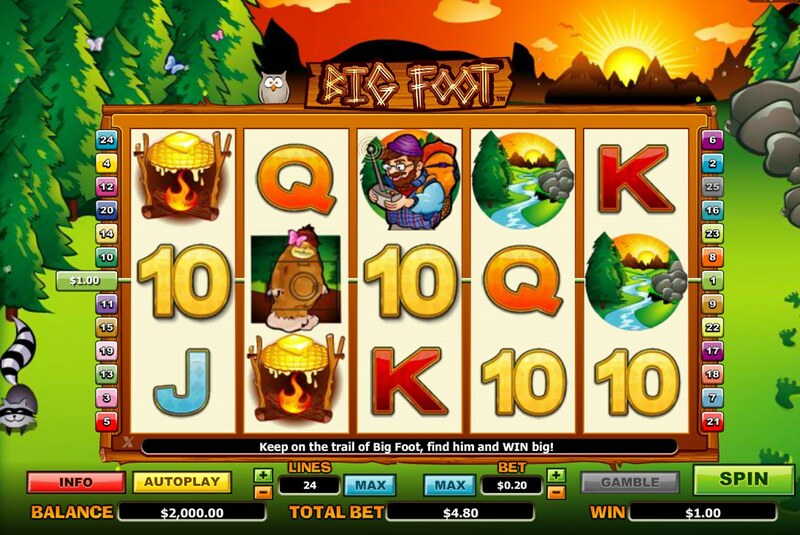 Three or more Bigfoot footprint Scatters triggers a free spins round, with 10 goes up for grabs which carry a 2x multiplier. Three Bigfoot symbols on reels 2, 3 and 4 triggers the other bonus round, a Pick Me Bonus that sees you having to find Big Foot in the forest. You have three chances to find the mysterious Yeti with your binoculars. Find him and a big juicy win is yours to go along with the bragging rights and a rather nice trophy on the wall. With some nice graphics and sound FX (stick on the headphones for those), Big Foot is diverting enough for adventure hounds. The bonuses won’t exactly set the world alight, and better multipliers on the free spins can certainly be found elsewhere. However, for some low-variance action, you can’t go wrong.